Clare kept their biggest performance for their most crucial game today as they beat Cork by nine points in Cusack Park. 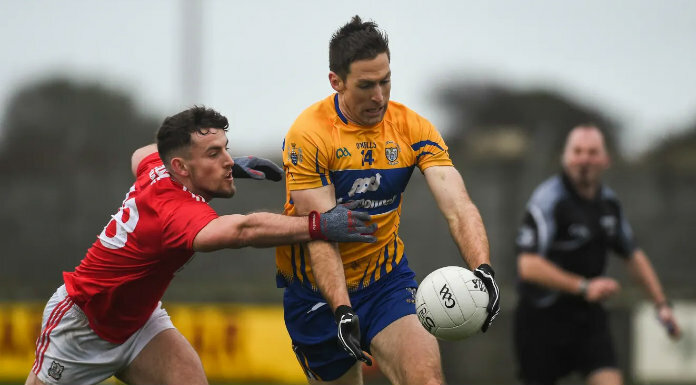 On a day Tipperary shocked Donegal, and Meath beat Armagh, Colm Collins’ team moved firmly into the pack in a very tight Division Two were only two points seperate the top seven teams. David Tubridy, Conal O hAinifein and Kieran Malone got the goals for the Banner as they led from start to finish. The first goal came in the opening minute. Jamie Malone nearly soccer-style found the target while David Tubridy was on hand to palm to the net though both players could lay claim to the strike. However, after Mattie Taylor replied, a second green flag had the home fans in historics as Conal O hAinifein found the target and Clare were 2-0 to 0-1 ahead after just four minutes. Clare were against the wind and struggled to build their tally as Luke Connolly, Stephen Cronin and Stephen Sherlock helped reduce arrears. But in the final 15 minutes of the half, Tubridy, Dale Masterson, Dean Ryan and Conor Finnucane ensured they held a 2-6 to 0-6 interval advantage. It was set up for Clare but Cork were never going to throw in the towel. The teams shared four scores with Jamie Malone and Sean Collins pointing for the saffron and blue before a Tubridy double made it 2-10 to 0-8 on 62 minutes. Ian Maguire got a Cork goal with six minutes remaining giving Ronan McCarthy’s side hope but Clar responed with three more white flags – a Tubridy brace sandwiching Conor Finnucane’s effort. Seven minutes of added time were played after an injury but Clare finished with the icing on the cake. Kieran Malone struck the third goal to give them a nine-point win. They’ll head to Kildare in two weeks feeling very confident. Scorers – Clare: David Tubridy 1-7, Conal O hAinifein 1-0, Kieran Malone 1-0, Conor Finnucane 0-2, Jamie Malone 0-1, Dale Masterson 0-1, Dean Ryan 0-1, Sean Collins 0-1. Clare: Pierce DeLoughrey; Kevin Hartnett, Cillian Brennan, Gordon Kelly; Dean Ryan, Aaron Fitzgerald, Conal O hAinifein; Gary Brennan, Darragh Bohannon; Gavin Cooney, Jamie Malone, Cian O’Dea; Keelan Sexton, David Tubridy, Kieran Malone. Cork: Mark White; Kevin O’Donovan, Kevin Flahive, Conor Dennehy; Stephen Sherlock, Stephen Cronin, James Loughrey; Ian Maguire, Ronan O’Toole; Tomas Clancy, Mark Collins, Mattie Taylor; Michael Hurley, Ruairi Deane, Luke Connolly.